After the surprise success of 2014's Ride Along, which took in $154 million worldwide from just a $25 million budget, it didn't take long for Universal Pictures to green light a sequel. Ride Along 2 hit theaters this January, and after another successful theatrical run, this comedy is debuting on Blu-ray and DVD April 26. 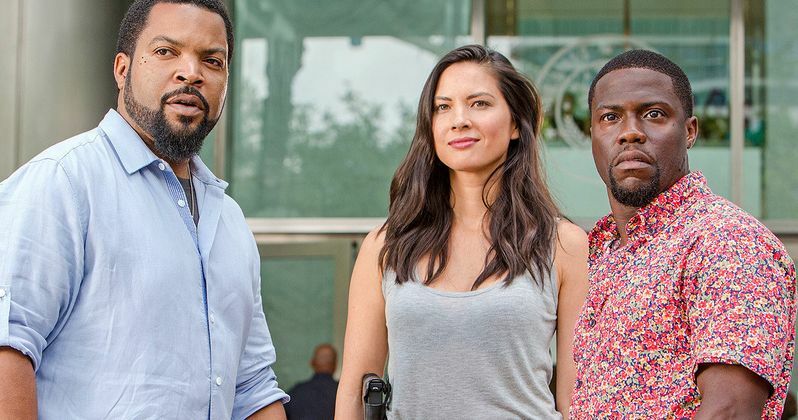 To get fans ready for this sequel's home video release, we have an exclusive deleted scene, where Miami detective Maya (Olivia Munn) takes Ben (Kevin Hart) and James (Ice Cube) to an impound lot, to find a new undercover vehicle. Fasten your seatbelts and brace yourselves for another wild ride when Kevin Hart (Get Hard, The Wedding Ringer) and Ice Cube (22 Jump Street, Barbershop) return in the hilarious, action-packed comedy, Ride Along 2, which is already available on Digital HD, with the sequel arriving on Blu-ray, DVD and On Demand April 26, 2016, from Universal Pictures Home Entertainment. The Blu-ray and DVD follows a successful theatrical release where the sequel earned $122.6 million worldwide from a $45 million budget. The brothers-in-law are back! Ride Along 2 reunites the partners and brothers-in-law-to-be as they take on new crime in Miami. The absurdity quickly unfolds while tough cop and all-around cool guy James (Ice Cube) works to solve a major case with the mouthy wannabe Ben (Kevin Hart). Directed by Tim Story (Ride Along, Think Like a Man), Ride Along 2 also stars Ken Jeong (The Hangover, Dr. Ken), Olivia Munn (The Newsroom, X-Men: Apocalypse), Benjamin Bratt (Despicable Me 2, Law & Order), Sherri Shepherd (The View, 30 Rock) and Tyrese Gibson (Furious 7, Transformers). Ben, a recently graduated police rookie, now aspires to be a detective like his soon-to-be brother-in-law, but James still doesn't think that he has what it takes for the job. He reluctantly takes Ben with him to follow up on a lead in Miami. Plans for a quick trip go awry when their unorthodox policing gets them into a compromising situation that threatens to derail a major case...And Ben's upcoming wedding day. Bonus features on the Blu-ray and DVD include Deleted Scenes, Gag Reel, Ride Along With Us, Behind the Scenes of Ride Along With Us, Kevin & Cube: Brothers-In-Law, Inside Black Hammer Vision and Feature Commentary with Director Tim Story. The Blu-ray also includes featurettes such as The Ride Diaries, The New Recruits, Ride Along With Kevin Hart and Cori's Wedding Commercial. Take a look at this deleted scene below, before picking up Ride Along on Blu-ray or DVD starting on April 26.